When the ordinary and out-of-the-box designs just will not cut it, consider a custom display. 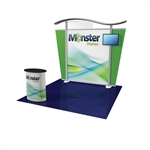 Monster Displays can create anything from a custom table top to a 20x20 island or larger. Visualize custom trade show displays: two-story truss designs with custom lighting or 10x10 panel displays with custom flooring. We focus on ease of set up and portability in our custom displays. Please call us at 1-888-323-6995 or email for assistance designing custom trade show displays. Dye-Sublimated Carpet Flooring - Call for price! Creating a custom display does not have to be challenging. 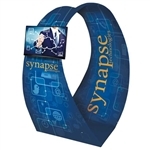 We have over 100 custom displays and accessories for you to brand with your company's messaging, logo, images and colors. If you have questions, we're here to help! Call us at 1-888-323-6995.